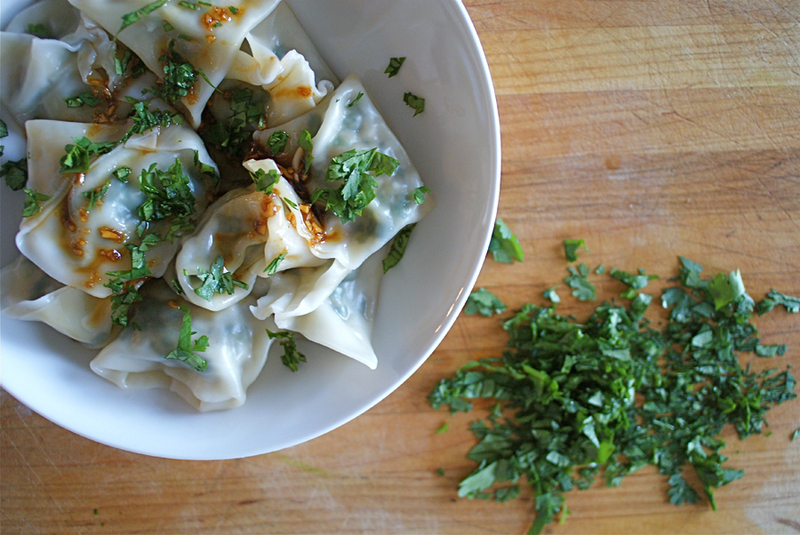 Store-bought wrappers make these dumplings pretty darn easy to make. With all the chard in the filling, they even become a one-dish meal. If time is your friend, go ahead and double the recipe and freeze the extra dumplings—lay them in a single layer on a baking sheet, freeze just until frozen, and transfer to a sealable plastic bag. Just pop frozen dumplings right in boiling water, adding a minute or two of cooking time for a dinner that’s as easy as take-out and way quicker in the moment. Juicy pork and earthy chard make a super flavorful filling in these simple dumplings. Cut out the thick stems from the Swiss chard leaves. Rinse the stems and leaves. Set the leaves aside. Finely chop the stems. Set a large frying pan over medium-high heat. Once it's hot, add the vegetable oil, swirl it around a bit, and add the chard stems. Reduce the heat to medium or medium-low. Cook, stirring frequently until the stems are softened, about 3 minutes. Meanwhile, chop the leaves and add them to the stems. Cook, stirring until the leaves are wilted and the liquid they give off evaporates, about 7 minutes. While the leaves cook, chop the green onions. Transfer the chard to a medium bowl, stir in the green onions, and let cool. While the chard cools enough so it's no longer steaming, grate in the ginger, and add the rice wine, soy sauce, chili oil, and toasted sesame oil. Stir to combine. Add the pork, breaking it up into small clumps as you add it to combine it thoroughly. Generously dust a large clean work surface with cornstarch, set a small dish filled with water to one side, and dust a large baking sheet with cornstarch. If you plan to cook the dumplings soon, put on a pot of salted water to boil. Lay 6 to 12 wonton wrappers on the cornstarch-dusted surface (if you're feeling confident, go with a dozen at a time; if you're a bit more nervous about making dumpling, keep the number small as you learn). Put a small dollop (about 1 teaspoon) of the chard-pork mixture on each wrapper. Do not be tempted to add more filling! Over-full dumplings will struggle to stay close as they cook and are liable to pop open. Dip a finger into the dish of water, and dampen the edges of each wrapper. Working with one dumpling at a time, fold the wrapper over the filling, turning the square into a triangle. Press any air bubbles out as you pinch the edges to seal them shut, then join the two corners that are furthest apart and pinch them together. Set the dumpling on the cornstarch-dusted sheet. Repeat with the remaining topped wrappers. Gently add the dumplings to the boiling water—add only as many as fit in a single layer across the pot. Boil until cooked through, about 3 minutes. Use a slotted spoon to lift the dumplings out of the water and transfer to he cooling rack or colander. Repeat with remaining dumplings. Divide the dumplings between 4 bowls, drizzle with the sauce, and garnish with chopped cilantro (if you like) to serve.